Editor’s Note: Much has changed since The Arc in Jefferson County began its journey 50 years ago, including the language that we use to describe people with intellectual and developmental disabilities. Though we deeply believe in the use of People First language today, it was unheard of all those years ago. In the context of this article you will find that we have made some modifications to the language used. The words “retarded” and “retardation” are completely unacceptable today and have been replaced in the text by the use of “r*”. Other terms, important to understanding the context in which people lived, are explained. Up until the mid-1900s, the future for a child born with a developmental disability was painfully bleak. More often than not, these infants and toddlers were whisked away to state homes where they lived for the rest of their lives, shut off from their family and community, often living out their lives in inhumane conditions. Daring to dream of something different, a group of parents committed to promoting the welfare of their children came together in Minneapolis in 1950, ultimately forming what would become known as The National Association of R*Children (NARC). In the decade that followed, hundreds of state and local chapters of The NARC began popping up across the country. Since that time, countless parents, allies, and self-advocates have shaped a movement that has transformed our culture. 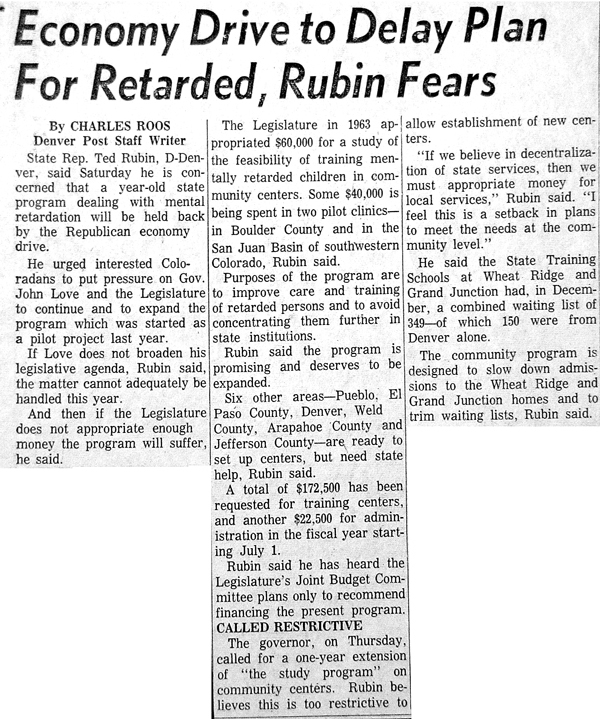 In Jefferson County, Colorado in the late 1950s, families of children with developmental disabilities had two choices: they could place their children in the state-run homes in present-day Wheat Ridge or Grand Junction, or they could keep their children at home. For families that chose the latter, they soon found there were no public programs to support their children. There were no employers that would hire young adults with disabilities, no home health support to assist with their child’s care, and no schools that would welcome their children. A new bill in the Colorado legislature presented an opportunity to begin building new choices for their children. 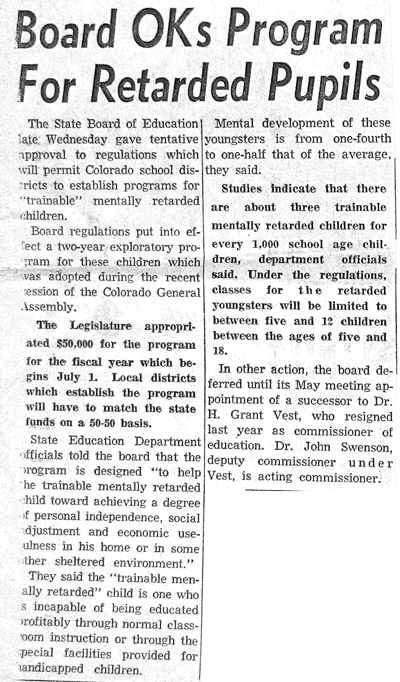 House Bill 36, scheduled to be heard in February 1960, would create a two-year pilot educational program for the "trainable mentally r*" in four districts throughout the state. 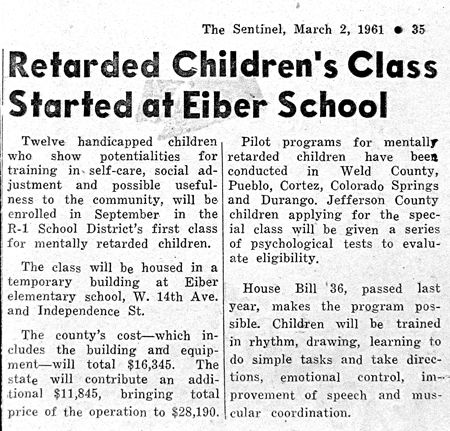 While special education existed in Jefferson County at that time, it was primarily for students with physical, visual or hearing impairments. The special education classes were usually held away from the student’s neighborhood school, and the students were often kept separate from their typical peers. In addition to students with the needs identified above, students considered to be “slow learners” with IQs above 75 were also allowed into district programs. 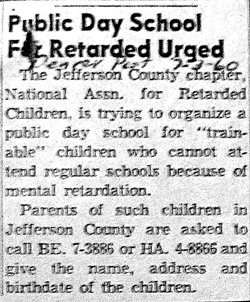 The language of the day deemed those children “educable” while students with IQs between 50 and 75 were labeled as “trainable.” Though these words are offensive to our ears today, they were an improvement over the prevailing belief at the time that children with developmental disabilities could not learn and would never be able to participate in their communities. Months before the bill was to be heard, a handful of Jefferson County parents met to discuss the formation of a local chapter of the National Association for R* Children. On January 21, 1960, our founders hosted a public meeting where the gathered attendees voted to form the Jefferson County Association for R* Citizens (JCARC). 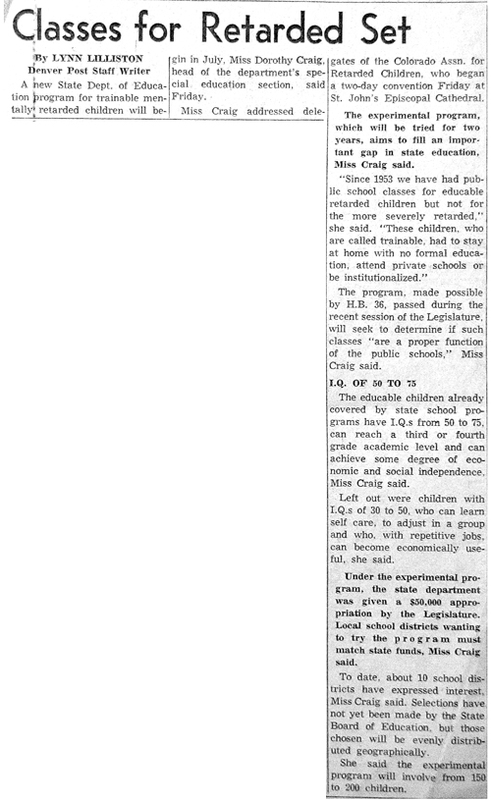 Upon passage of HB 36 in the spring of 1960, school districts statewide could apply to be selected for the pilot program. With support from the state chapter, the health department, and special education leadership from Jeffco Schools, JCARC leaders dedicated their efforts to establishing such a program in our county. One of the Jefferson County ARC’s charter members included then principal of the special education program at Eiber School, Mrs. Opal Sparks, who served as a liaison with district leadership. Throughout the spring of 1960, Mrs. Sparks and other volunteers drew up recommendations for a “trainable” program, sought out interested families in the area, and began looking for a site to house the program. Although Jeffco was not selected for the pilot program, our members went ahead and presented their findings to district leadership in the fall of 1960. Compelled by their findings, Jeffco School District opened its first classes for “trainable” students at Eiber Elementary School in the fall of 1961, with Mrs. Sparks serving as principal for the program. The program would accommodate six children in a morning class and an additional six children in an afternoon class. Through their efforts to get the program established in Jefferson County, JCARC leaders had initially identified 49 children who would benefit from such an opportunity. By the time the classes began in 1961, more than 125 potential students had been identified. With the limited classroom space in the district, more than one hundred Jefferson County children were still in need of a school to welcome them. In the midst of all this activity, The Arc in Jefferson County continued to work to formally organize. It was first recognized as a nonprofit organization by the Internal Revenue Service in 1961, more than a year after local residents first came together to fight for the right for their children to receive an education. 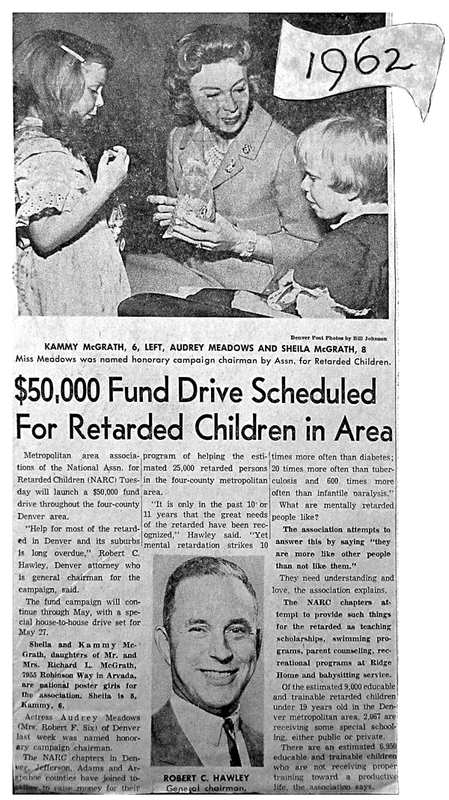 The early 1960s were exciting times for the nation, and especially pivotal for advocates of people with intellectual and developmental disabilities. In November 1960, President John F. Kennedy was elected President of the United States. Because of his sister Rosemary’s disability, he used his influence to spotlight the needs of our community, creating a national dialogue that helped to spur advancements throughout the country. 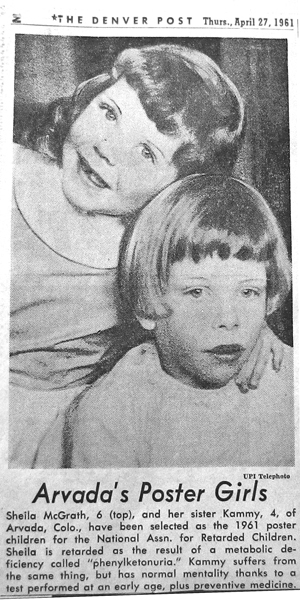 That same year, the National ARC named Jefferson County sisters Sheila and Kammy McGrath as national poster children for the association. The girls and their parents met with President Kennedy in November as part of National R* Children’s Week. Just weeks earlier Kennedy had announced the creation of The President’s Panel on Mental R*, which brought together disability experts and leaders to study the needs of our community and make policy recommendations. Kennedy’s influence bolstered the efforts of disability advocates across the nation, initiating a movement towards community-based options for people with developmental disabilities for the first time in our nation’s history. With the entire country focused on improving conditions for people with intellectual and developmental disabilities, The Arcs everywhere were moved to action. The JCARC aligned closely with the national organization, attending conferences throughout the country to learn about new frontiers for our children and adults. The next few years brought a flurry of activities for the Jefferson County ARC. As JCARC’s leadership learned about communities with recreational programs and workshops for people with disabilities, they spent much of 1962 developing similar programs in our own community. In early 1963 they launched a part-time recreational program at the old county fairgrounds. By the fall of that same year, the program had evolved into “The Jefferson County Association for R* Children Trainable Classes” and had moved to Lakewood Methodist Church. The classes were staffed by volunteers and two teachers who were paid by Jeffco Schools. Funding was an ever-present need for our founders, especially as the recreation programs and classes developed. A variety of small-scale fundraisers were held, but it was evident more than strategic efforts were required. In early 1962, the JCARC and other metro-area chapters formed the Metropolitan Association of R* Citizens (MARC), which consisted of representatives from each chapter. Collectively they were tasked with coordinating fundraising for all of the chapters. MARC’s first coordinated fund drive hoped to raise $50,000 and featured celebrity support from actress Audrey Meadows, a Denver native. The following year, the MARC fund drive doubled its goal to $100,000 and included celebrity support from actress Barbara Rush. During her visit to Denver, Mrs. Rush met with the special education staff at Fletcher Miller School, including then principal Mrs. Opal Sparks and district Special Education Director Dr. Robert Weiland. Our chapter was represented at MARC by Mr. Dez Rubano, who was a father of a young girl with both cognitive disabilities and a hearing impairment. Fortunately for JCARC, he was also an accomplished jazz musician. Bearing primary responsibility for our fundraising goals and knowing that funding from MARC’s efforts wouldn’t start to come in for some time, Mr. Rubano persuaded the JCARC board to sponsor a jazz concert to benefit our chapter. 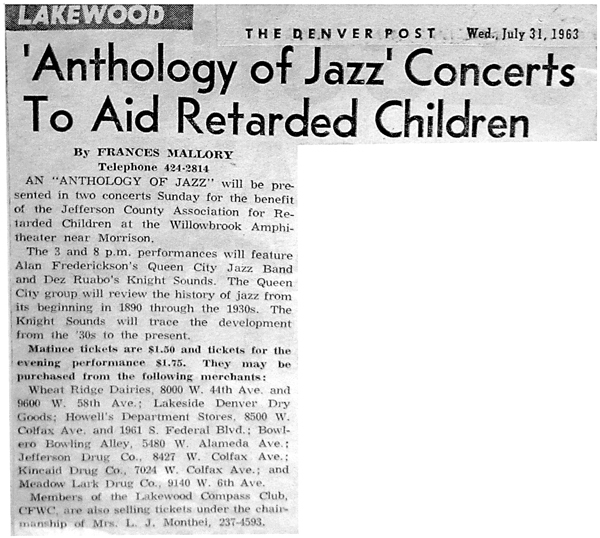 In August 1963, Mr. Rubano hosted our first “Anthology of Jazz” concert at Willowbrook Amphitheatre in Morrison, Colorado. The concerts were heavily promoted in newspapers, sometimes featuring photos of Mr. Rubano’s daughter, Annemarie. When all was said and done, this first concert raised more than $1,000 for our chapter, a huge sum of money at the time. 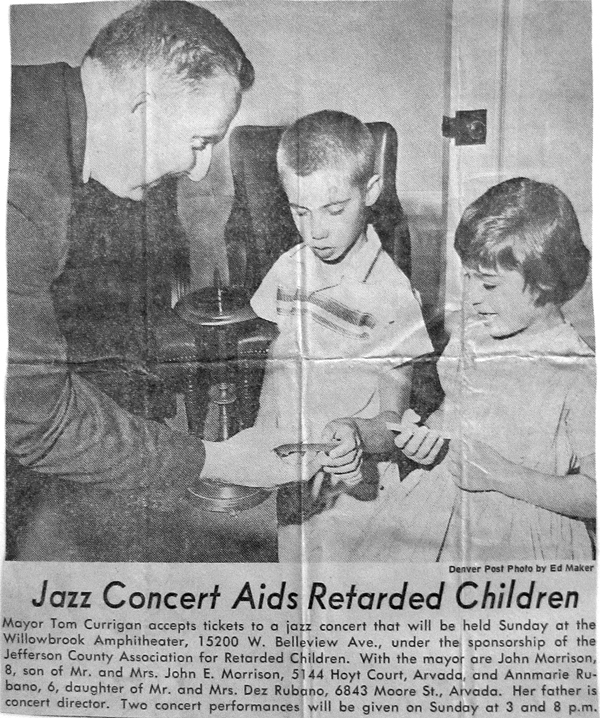 With the overwhelming success of their first major benefit, a second concert was held in 1964. It was not long before Mr. Rubano was asked to conduct these concerts on behalf of the Metropolitan Association so that other local chapters could benefit also. This bold leadership in fundraising established a solid funding base that would prove critical in coming years. The more parents got together to discuss the needs of their children, and the more information they gathered about programs in other communities, the more convinced they became that community programs for people with developmental disabilities were critically needed. President Kennedy himself was pushing for community-based programming, which would both benefit people with disabilities and relieve the budgetary strain of housing individuals in state homes. Compelled by the Kennedy’s initiatives, the Colorado Legislature passed HB 121 in the spring of 1963. The bill created two one-year pilot programs to “determine the best method for providing for the community care” of people with intellectual and developmental disabilities. It also established a state coordinating and advisory board to study and coordinate all services in this area. The programs would focus primarily on meeting the residential needs of its participants. While this bill generated a great deal of excitement amongst JCARC members and across the state, Jefferson County was disappointed again at not being selected for the pilot program. However, JCARC leadership monitored the progress of these programs and prepared for new legislation in the coming year that might extend the program statewide, HB 1090. Advocates throughout the state, including members of JCARC, lobbied extensively to expand the scope of this bill to include a range of programming for both children and adults that was truly progressive for its time. 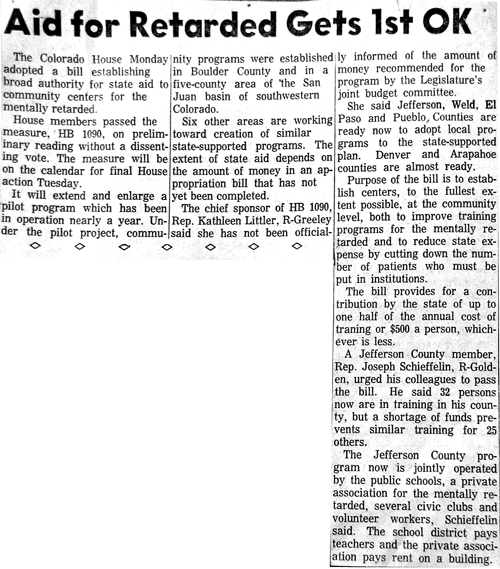 On March 27, 1964, HB 1090 was enacted by the General Assembly of the State of Colorado, with the community-centered board (CCB) services to begin July 1, 1964. The Jefferson County Community Center for the R*(JCCC) was open for business. Because the law required the community centers to be private nonprofits, a board of directors was formed -- consisting largely of members of the Jefferson County ARC, including our board president Maurice Archer. Dr. Robert Weiland, a special education administrator for Jeffco Schools and member of the JCARC board, was elected president of the newly-formed JCCC board. In the next several weeks, Jefferson County ARC members contributed more than 400 volunteer hours to ensure the Center was ready for its opening that fall. In September of 1964, the Center took over operation of the classes at Lakewood Methodist Church. In total, the Center managed two preschools, a day care class, three school classes, and a sheltered workshop. In four short years, our founders had successfully created significant new opportunities for families who chose to keep their children in the community. Although this was a major achievement, there were still problems to overcome. The Center had a budget of $50,000 and was required to raise almost half of it themselves through cash or in-kind donations. A large share of this was absorbed by Jeffco Schools as they continued to pay the salaries of two teachers. Countless volunteers trained by the American Red Cross staffed programs, led by volunteer coordinator and elected County Superintendent George Hook. Many community members donated necessary furniture and supplies. Some revenue came from student tuition fees, but a large portion of the financial support came from the Jefferson County ARC, as we were flush with cash from our recent jazz benefits. For the next several years, The Arc in Jefferson County provided critical leadership and financial support to the Center as we all worked together to strengthen this new organization and expand the opportunities of people with developmental disabilities in our community. In the first chapter of our poignant history, Jefferson County witnessed the dawning of a new way of thinking about people with intellectual and developmental disabilities. Across our state, and our country, a foundation had been laid by countless dedicated people determined to enrich the lives of their loved ones. From this foundation sprang the next chapter of our history — yet another story that must be told. 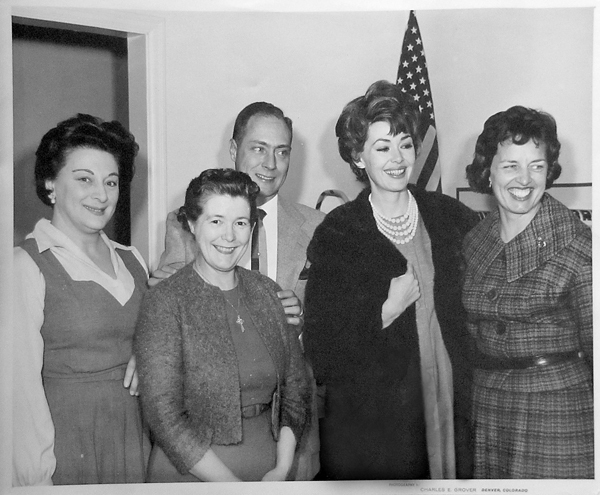 From right: Mrs. Opal Sparks, Barbara Rush, Bob Weiland. The names of the other two teachers are unknown. Photo courtesy Mrs. Opal Sparks.